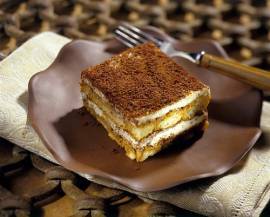 This is the best tiramisu you will ever taste! Years ago, I tasted tiramisu made this way in Venice. I played around with several recipes until I came up with this one. It's better than anything you will taste in a restaurant and people constantly ask me for the recipe. Tiramisu is best served the same day it's made. Preheat oven to 350 degrees F/180 degrees C. Grease and flour two 9-inch round or square cake pans. Sift the flour and cornstarch together in a bowl. Set aside. Whisk the egg yolks together with the vanilla. Add 3/4 cup sugar and beat for 5 minutes. In a separate bowl, beat the egg whites with the salt until soft peaks are formed. Add 3/4 cup sugar in a steady stream until stiff peaks are formed. Gently fold the egg mixtures together. Fold in flour mixture, a third at a time. Pour batter in prepared cake pans and bake in preheated oven for about 25 - 30 minutes. Cool the cakes 10 minutes in the pans and then invert them onto a wire cake rack. When the cakes are cooled, cut each layer in half using a serrated knife. Place the first layer on a cake plate so the cut side is facing up. Generously spread the Espresso Syrup (See How to make Espresso Syrup below) all over the cake. In between each layer, spread the Zabaglione Filling (See How to Make Zabaglione Filling below). On the top of the cake, use a sieve to sprinkle the cocoa powder. You can also add chocolate curls on top. Place sugar, water and espresso in a medium-sized saucepan. Bring to a boil. Allow the mixture to cool before adding rum. Place the egg yolks, marsala wine, and sugar in the top of a double boiler, over simmering water. Whisk until pale yellow (this takes quite a while, so use a hand held electric beater). Continue whisking the mixture off the heat until cool. Combine the egg mixture with the marscapone cheese. In a separate bowl, beat the heavy cream until soft peaks are formed. Fold the egg mixture into the heavy cream, one-third at a time. Refrigerate until ready to serve. To serve, cut tiramisu into squares (or if you are making tiramisu in round cake pans, cut tiramisu into wedges). I really like this recipe. I will share (with your name) on my Facebook page.